Tesco has seen its share of the UK grocery market dip below 30% for the first time in nearly seven years, figures have shown. In the 12 weeks to 22 January 2012, Tesco's share dropped to 29.9%, the lowest since May 2005, research firm Kantar Worldpanel said. Tesco has described its Christmas trading period as "disappointing", after like-for-like sales fell 2.3%. In contrast, Sainsbury's and Iceland both gained market share. Sainsbury's edged up from 16.6% a year ago to 16.7%, its strongest hold since March 2003. Iceland's share rose from 1.9% to 2.1%, its best share for 10 years. This time last year, Tesco had a 30.5% share of the market. Of the other big four supermarkets, Asda's share rose sharply from 16.9% to 17.5%, thanks to the conversion of Netto stores to the Asda brand. Morrisons' share slipped from 12.4% to 12.3%. The top supermarkets were involved in a price war over the festive period, started by Tesco's £500m Big Drop Price campaign which launched in early October. But the company later admitted that its spending on the campaign had not been successful. Meanwhile, low-cost chains also saw their share of the market grow, with Aldi up from 3.1% to 3.5% and Lidl up from 2.4% to 2.5%. 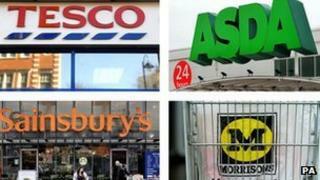 Supermarket price war: Can they all be cheapest?